Almost two months in, and I can see the end of the Silver Tower painting project...just not quite there yet. However, this week, I got a lot closer by finishing off the 8 Chaos Familiars and 2 Deathstalker models. The Familiars are great little models; full of whimsey. There are the walking books, the fish, dragonettes and..."moon-headed guys"...whatever they are. I felt I had the freedom to really go to town on these guys and just make up all sorts of outrageous paint schemes. So, that's what happened. The Deathrunner model was pretty cool. I had done some Skaven last year, so was familiar with how I'd approach doing this guy. A simple paint scheme, but the model is strong enough to show off with just minimal paint attention. 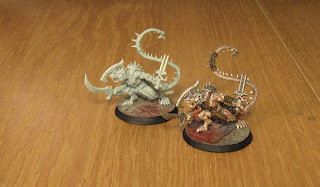 Well, all that's left on the adversary side of the game is the Ogroid and Gaunt Summoner. They are next! GW has a pile of new terrain pieces out for Age of Sigmar, and these Baleful Realmgate models caught my eye. 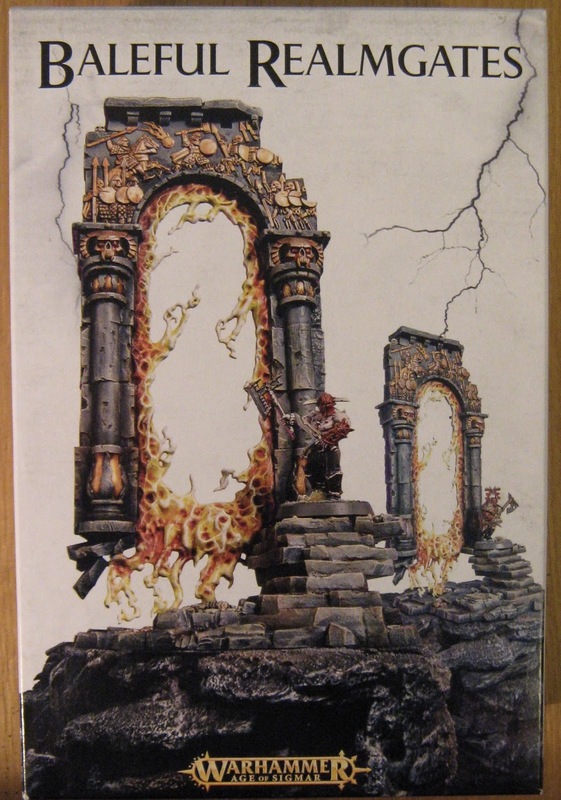 A short build and painting project to make up for the pitiful gate model I've been using in the D&D game. When it comes to assembly line painting lots of figures for a table-top army, it doesn't get much easier than skeletons. 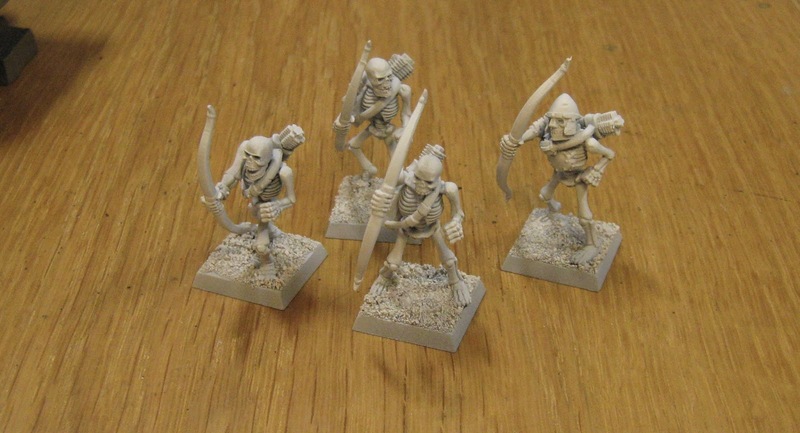 Here's a quick way to get lots of skellies on the table. First, the main set of painting operations are laid out here for you. White base coat, a home-made dark wash, bone, umber and then aged white. So, I've started with some skeleton archers from the GW Tomb Kings Skeleton Warriors box. Here, assembled and based with sand. 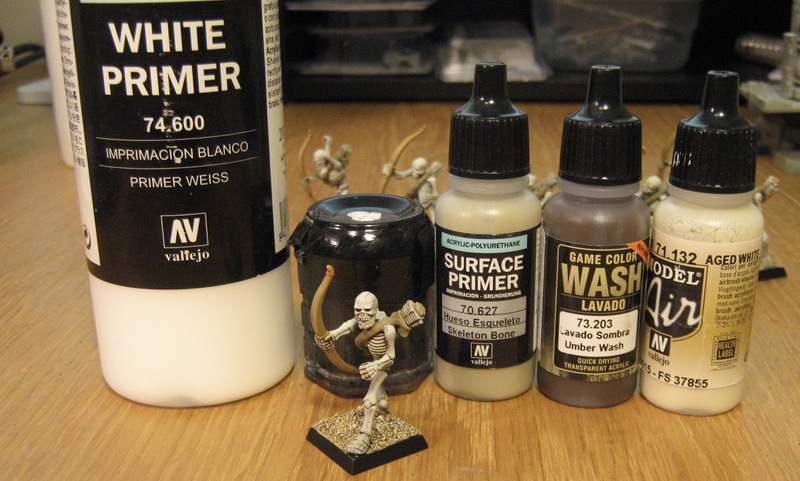 The simple process begins with a base coat of white spray. Next is a brushed-on coat of home-made dark wash. The recipe is pretty straightforward: floor wax, a little black paint and a little dark brown paint. Finally, a touch of matt medium to take the shine off. 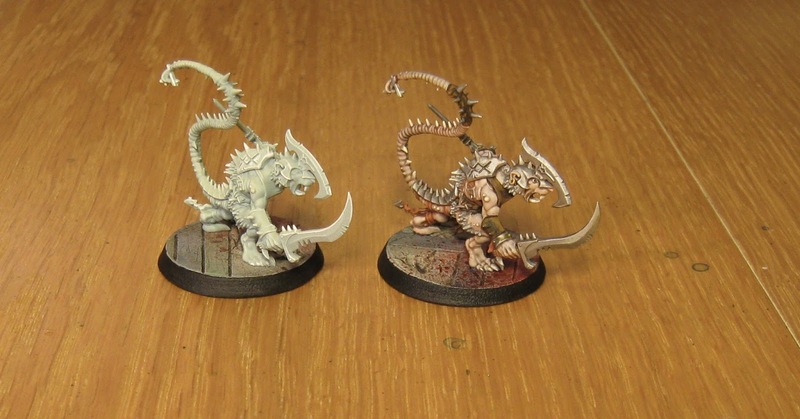 Here, the base coated white models are on the left, and the dark-washed models are on the right. Next comes a light overspray of Vallejo Skeleton Bone. You can see it applied to the models on the right in this photo. The next step is a glaze of Umber Wash. That's Umber Wash mixed with some Vallejo Glaze Medium. 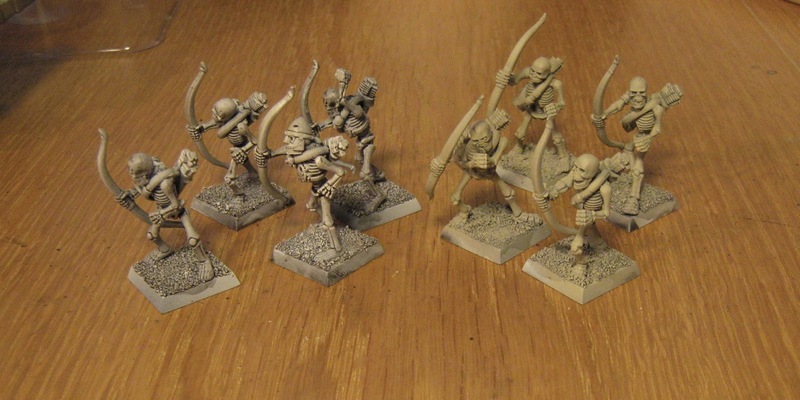 Here, the skeletons on the right have the glaze layer applied. Finally, each model gets a final spray of Aged White, just from the top down. 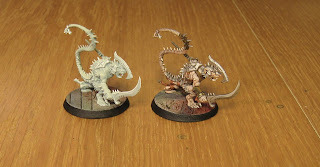 Once all the bone is done, it's time to paint in the few details on the models. This includes the bows, quivers and a few bits of armor and jewelry. And then it's time to finish off the bases. 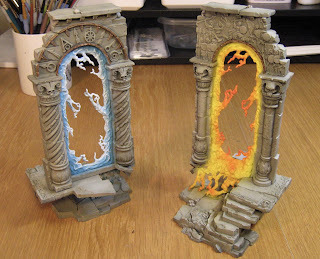 These are done with the Foundry Base Sand set of colors. Quick and perfectly fine table-top quality models. Ready for just about any game system you care to use. The Silver Tower project continues. 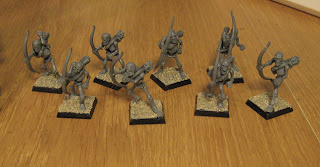 Today, the Grot Scuttlings came off the hobby table. Hmmm, really don't like these figures much. But now at least they're painted, and the whole project is more than half over. Next will be the Deathrunner, I think. OK, Warmachine Mk3 is out. That means that all my Mk2 stuff is garbage. 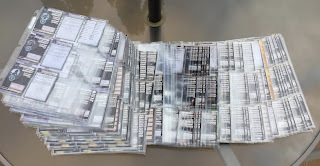 So I pulled out all my Mk2 unit cards. Ouch...and this went into the garbage. Oh well, that's the way of it. Had another Mk3 game this evening with Elliot and had a good time. Still pretty rusty with my rules so far...but playing to get better. Liking my new Thyra list.